Today I had the awesome and eagerly anticipated privilege of attending a screening of the new film Interstellar, directed by Christopher Nolan. One can’t help but be impressed by Nolan’s fertile visual imagination. But you should know that Caltech’s own Kip Thorne also had a vital role in this project. Indeed, were there no Kip Thorne, Interstellar would never have happened. On June 2, 2006, I participated in an unusual one-day meeting at Caltech, organized by Kip and the movie producer Lynda Obst (Sleepless in Seattle, Contact, The Invention of Lying, …). Lynda and Kip, who have been close since being introduced by their mutual friend Carl Sagan decades ago, had conceived a movie project together, and had collaborated on a “treatment” outlining the story idea. The treatment adhered to a core principle that was very important to Kip — that the movie be scientifically accurate. Though the story indulged in some wild speculations, at Kip’s insistence it skirted away from any flagrant violation of the firmly established laws of Nature. This principle of scientifically constrained speculation intrigued Steven Spielberg, who was interested in directing. The purpose of the meeting was to brainstorm about the story and the science behind it with Spielberg, Obst, and Thorne. A remarkable group assembled, including physicists (Andrei Linde, Lisa Randall, Savas Dimopoulos, Mark Wise, as well as Kip), astrobiologists (Frank Drake, David Grinspoon), planetary scientists (Alan Boss, John Spencer, Dave Stevenson), and psychologists (Jay Buckey, James Carter, David Musson). As we all chatted and got acquainted, I couldn’t help but feel that we were taking part in the opening scene of a movie about making a movie. Spielberg came late and left early, but spent about three hours with us; he even brought along his Dad (an engineer). 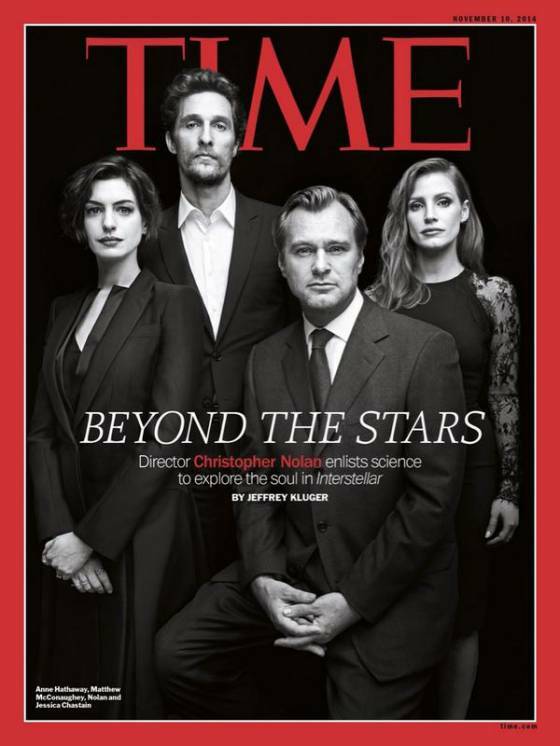 Though the official release of Interstellar is still a few days away, you may already know from numerous media reports (including the cover story in this week’s Time Magazine) the essential elements of the story, which involves traveling through a wormhole seeking a new planet for humankind, a replacement for the hopelessly ravaged earth. The narrative evolved substantially as the project progressed, but traveling through a wormhole to visit a distant planet was already central to the original story. Inevitably, some elements of the Obst/Thorne treatment did not survive in the final film. For one, Stephen Hawking was a prominent character in the original story; he joined the mission because of his unparalleled expertise at wormhole transversal, and Stephen’s ALS symptoms eased during prolonged weightlessness, only to recur upon return to earth gravity. Also, gravitational waves played a big part in the treatment; in particular the opening scene depicted LIGO scientists discovering the wormhole by detecting the gravitational waves emanating from it. There was plenty to discuss to fill our one-day workshop, including: the rocket technology needed for the trip, the strong but stretchy materials that would allow the ship to pass through the wormhole without being torn apart by tidal gravity, how to select a crew psychologically fit for such a dangerous mission, what exotic life forms might be found on other worlds, how to communicate with an advanced civilization which resides in a higher dimensional bulk rather than the three-dimensional brane to which we’re confined, how to build a wormhole that stays open rather than pinching off and crushing those who attempt to pass through, and whether a wormhole could enable travel backward in time. Spielberg was quite engaged in our discussions. Upon his arrival I immediately shot off a text to my daughter Carina: “Steven Spielberg is wearing a Brown University cap!” (Carina was a Brown student at the time, as Spielberg’s daughter had been.) Steven assured us of his keen interest in the project, noting wryly that “Aliens have been very good to me,” and he mentioned some of his favorite space movies, which included some I had also enjoyed as a kid, like Forbidden Planet and (the original) The Day the Earth Stood Still. In one notable moment, Spielberg asked the group “Who believes that intelligent life exists elsewhere in the universe?” We all raised our hands. “And who believes that the earth has been visited by extraterrestrial civilizations?” No one raised a hand. Steven seemed struck by our unanimity, on both questions. I remember tentatively suggesting that the extraterrestrials had mastered M-theory, thus attaining computational power far beyond the comprehension of earthlings, and that they themselves were really advanced robots, constructed by an earlier generation of computers. Like many of the fun story ideas floated that day, this one had no apparent impact on the final version of the film. Spielberg later brought in Jonah Nolan to write the screenplay. When Spielberg had to abandon the project because his DreamWorks production company broke up with Paramount Pictures (which owned the story), Jonah’s brother Chris Nolan eventually took over the project. Jonah and Chris Nolan transformed the story, but continued to consult extensively with Kip, who became an Executive Producer and says he is pleased with the final result. Of the many recent articles about Interstellar, one of the most interesting is this one in Wired by Adam Rogers, which describes how Kip worked closely with the visual effects team at Double Negative to ensure that wormholes and rapidly rotating black holes are accurately depicted in the film (though liberties were taken to avoid confusing the audience). The images produced by sophisticated ray tracing computations were so surprising that at first Kip thought there must be a bug in the software, though eventually he accepted that the calculations are correct, and he is still working hard to more fully understand the results. I can’t give away the ending of the movie, but I can safely say this: When it’s over you’re going to have a lot of questions. 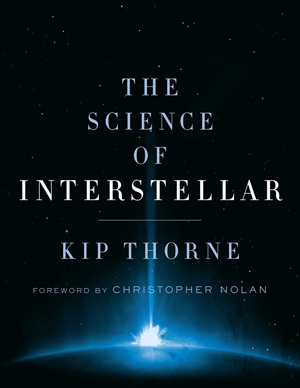 Fortunately for all of us, Kip’s book The Science of Interstellar will be available the same day the movie goes into wide release (November 7), so we’ll all know where to seek enlightenment. In fact on that very same day we’ll be treated to the release of The Theory of Everything, a biopic about Stephen and Jane Hawking. So November 7 is going to be an unforgettable Black Hole Day. Enjoy! This entry was posted in News, The expert's corner and tagged Christopher Nolan, Interstellar, Kip Thorne, Lynda Obst, Steven Spielberg by preskill. Bookmark the permalink. Oh, it turns out “Contact” runs 150 minutes, so the two films are of comparable length. I didn’t remember it being that long. Yes, when Sagan was working on Contact, he sought Kip’s advice regarding long-distance space travel, and Kip suggested wormholes. Kip started doing some calculations to back up the suggestion, which turned out to have a big stimulative effect on Kip’s own research. Well, I don’t care what the rest of the world thinks. I think “Silent Running” is one of the best science fiction movies EVER made. Interstellar, for its few flaws from a purely filmmaking perspective, delivered massively from an imaginative ambitious story perspective. More sci-fi movies should have a scientists imagination powering them. On that note, how do I get Kip Thorne’s job, of a science consultant? 866-795-6933. Individuals have distinctive explanations regarding why they bet. be poker, football or horse racing.